The most admirable thing about the Souls series is that it isn’t afraid to take risks. While most games hold the players hand and teach them absolutely everything, Souls lays out the bare foundation and sets you off on your journey. You are given naught but the basics and must learn the rest through exploration and experimentation, finding your own way through the dark. I couldn’t be happier to say that Dark Souls II is every bit as challenging, rewarding, and utterly brilliant as its predecessors, even if a few of the changes weren’t for the better. Dark Souls II has you playing the role of an undead as he/she attempts to remove the curse that is cast upon him/her for reasons unknown. Like the previous entries in the series, the plot is told in an interesting way in that it denounces any sort of cutscene/expositional format, and instead has you searching for the answers yourself. This can be done in several ways, from engaging in dialogue with NPCs as they spout off vague clues, or reading item descriptions that tell tales of old and fill in the blanks. The game never beats you over the head with what is happening, and you might even find yourself unsure of what has transpired after completing your journey, only to encourage you to delve deeper and find the answers for yourself. 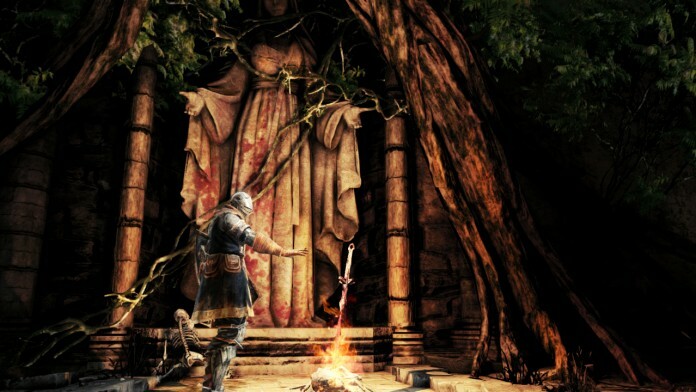 It is a very rewarding and mysterious way of telling a story, and it is enhanced by the wonderful characters introduced to you within your approximately 60 hour journey in Drangleic. From the ever tricksy Mild-Mannered Pate to the crestfallen Lucatiel of Mirrah, you’re bound to fall in love with the eclectic cast of characters. Benhart of Jugo, the Scottish Knight obsessed with his beloved sword becomes a sort of friend and companion, while Gavlan, a bearded dwarf, offers you broken English and a place to sell your wares! 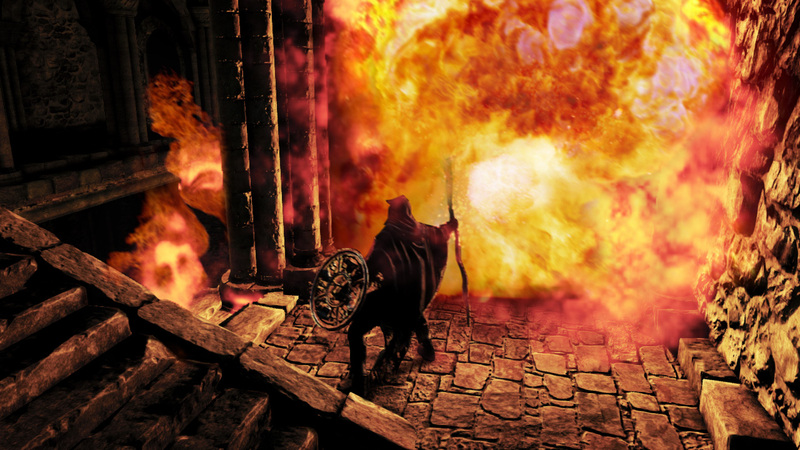 You’re always hoping to run into someone interesting, and like the previous Souls games, Dark Souls II is no exception. Like the NPCs, the world design is colourful, grotesque, and fascinating. Each area feels as if it were torn out of a high fantasy novel and transformed into a macabre setpiece. From vast forests made from the corpses of giants, to a pirate cove built within a dank, dark cavern, you will always want to take a moment to ponder what you’re seeing. Sweeping landscapes with frightening, yet comforting horizons grace every corner, and utterly hideous sights are placed to contrast the beauty of Drangleic. The enemies you will face in each area help keep that fragile atmosphere in check with their placement and designs. Each time you venture into a new area of Drangleic, you will run into a myriad of new enemy types. They never feel out of place, instead, feel perfectly natural, as if you just happened to encroach on their environment. The bosses are much the same, in that they feel like the truly do live in this world. The design of the bosses in Souls are always a selling point for me, as the artists at From Software know how to make tired ideas captivating and frightening. Each boss you will face is more surprising than the last, and they all have their own subtle design and attack patterns that make them a thrill to fight. 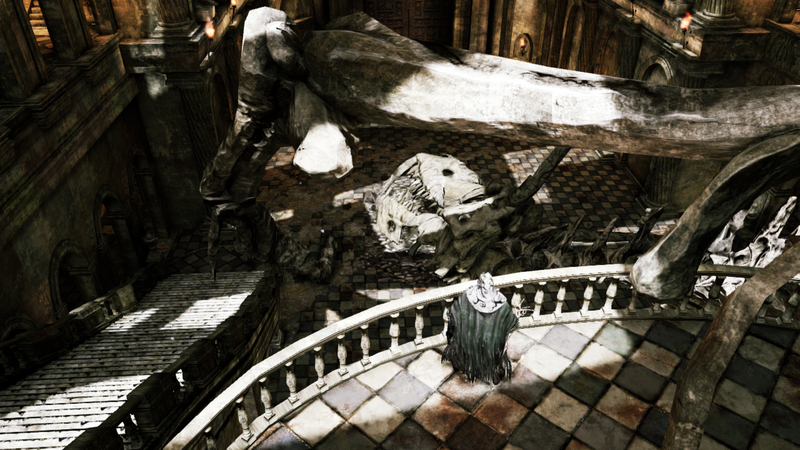 All of this is rendered within Dark Souls II’s updated engine. Boasting advanced lighting and particles, this game successfully shines brighter than ever before, though it comes at a cost. The textures in Dark Souls II are noticeably lower in quality, and it is jarring to walk into a beautiful castle with hilariously awful textures in some of the objects. I never found that the textures detracted from the atmosphere or design, but it is noticeable to say the least. Luckily, the frame rate has improved drastically over Dark Souls, with no areas being even remotely comparable to the infamous Blighttown. It’s somewhat impressive considering the lighting they have crafted. Running through a corridor with a torch is often thrilling, as it seems like lighting was studied religiously before implementation. The shadows are wonderful and spooky, and walking into a new area just to see ash from a flame glimmer through the rays of the sun is breathtaking in some locales. These kinds of aspects really further the atmosphere, making dusty ruins feel filthy and untouched, and coasts of the seemingly endless shore feel tranquil and serene. The music in Dark Souls II is as memorable and gorgeous as Dark Souls before it, and each track was made with respect for the environment and boss encounter it coincides with. You will have your typical God choruses and strings sections, but they do manage to transcend other staples in the genre, while offering a more bizarre twist. 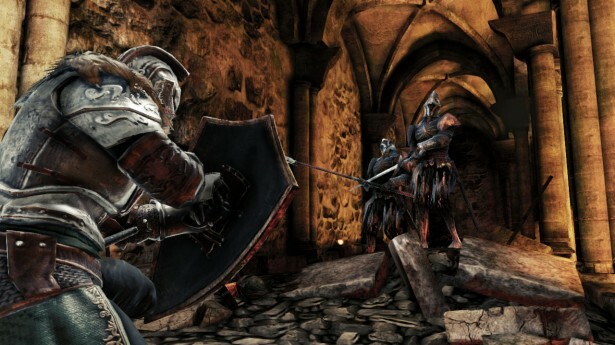 Beyond the more artistic side of Dark Souls II, the gameplay remains mostly unchanged. The combat is still weighty, deliberate, and offers visceral swordplay that few games achieve to this magnitude. There are still many builds you can create, from a Katana wielding Thief to a spell slinging temple knight. Magic has been overhauled this time around by allowing the player to essentially ‘level up’ spells capacity and damage, while giving mages the option of a strong and weak attack. Archery was also revamped by allowing a player to move while firing arrows. Little things like this have been expanded upon in Dark Souls II, and it makes a lot of the game feel even more refined in the end. 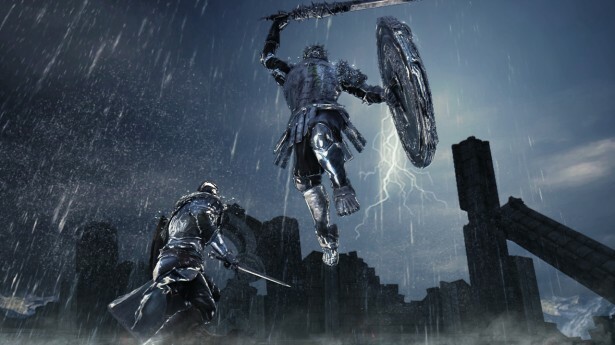 Unfortunately not all of the changes are for the best, as a statistic called Soul Memory has somewhat ruined the co-operative aspects of Dark Souls II, putting players not only behind a level wall, but a skill wall as well. Soul Memory calculates the collection of souls you’ve attained throughout your journey, and pairs you up accordingly. This sounds nice in theory, but makes summoning a much rarer activity. This truly becomes a problem when you attempt one of the bosses that are clearly designed for co-op, yet cannot find a buddy to help you. 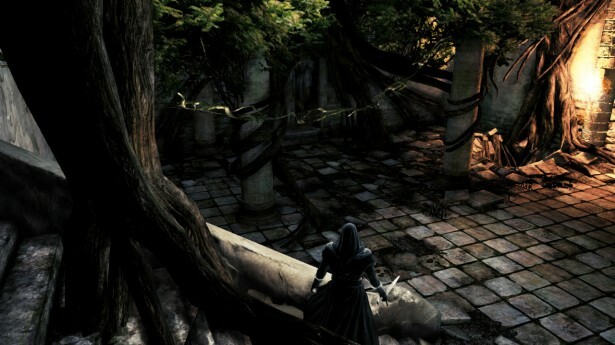 Though I could delve deeper into the numerous small changes, like most of the things in Dark Souls II, it’s best to explore and discover for yourself. Dark Souls II is an absolute colossus of a game. It features almost unparalleled amounts of meaningful customization, bizarre worlds to explore, repulsive bosses to conquer, and endless secrets to discover. It is not only better than Dark Souls, but it might be one of the best RPG’s I’ve ever played. Previous articleWhatever Happened to… Cheat Books and Tips Hotlines?